We in America are accustomed to arguments for and against abortion based on the privacy assured in the fourteenth amendment. We aren’t all that used to the Supreme Court using first amendment arguments to allow one side or another to plead its case to women who seek out information prior to the procedure. But that is just what happened in the most recent Supreme Court decision that gave a victory to those who wish to counsel women away from the procedure. The First Amendment prohibits the government from forcing the centers, which oppose abortion on religious grounds, to post notices at odds with their beliefs, Justice Clarence Thomas wrote for a five-justice majority. He was joined by the court’s more conservative members. Meaning that crisis pregnancy centers which do not offer the service do not have to advertise for the facilities that do. Justice Thomas was joined by his fellow jurists Alito and Gorsuch and Chief Justice John Roberts. Justice Anthony Kennedy added his own words to the majority. Which brings religious liberty into the equation yet again in this SCOTUS session. 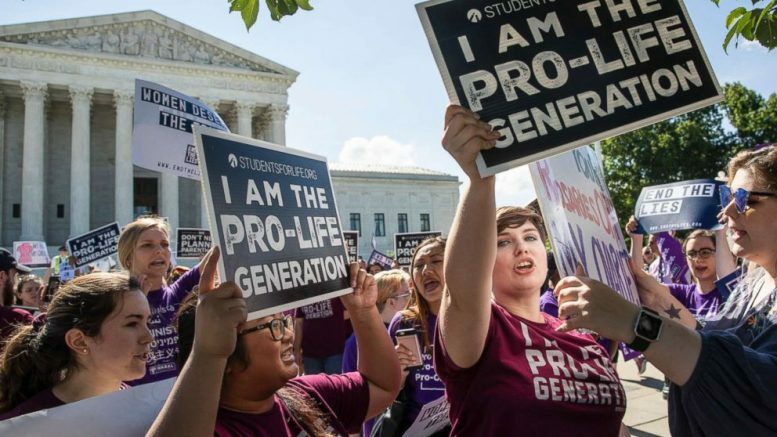 The liberals, of course, argued precedent requires a different outcome, but for now, it seems that the court is leaning toward individual liberty in all ways, and that includes speaking in opposition to murdering babies in the womb.